From 27 July to 31 July 2015, representatives from more than 110 countries gathered at United Nations Headquarters in New York upon invitation of the European Union to negotiate the International Code of Conduct for Outer Space Operations. 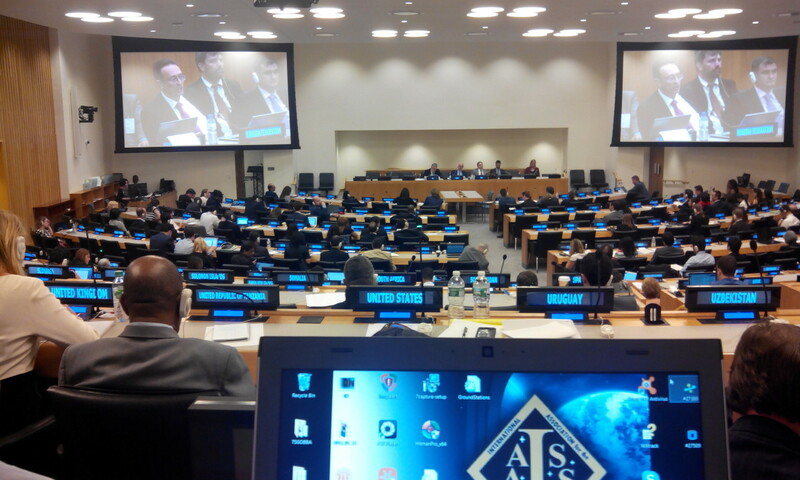 The International Association for the Advancement of Space Safety (IAASS) attended the meeting as invited Observer. The International Code of Conduct for Outer Space Operations is a European Union diplomatic initiative meant to address at the same time security, safety and sustainability issues of space operations. Security pertains to threats to space systems which are voluntary (i.e. aggressive nature), instead safety deals with threats that are non-voluntary (e.g. unwanted collisions, failures, uncontrolled reentries, etc.). The main driver of the International Code of Conduct for Outer Space Operations is security, and most of its content deals with transparency and confidence building measures for military space operations. Safety is included in the scope of the code but actually only vaguely addressed, just to recognize the interest and need for international cooperation by all space operators: commercial, civil and military. Military commands have a keen interest in regulating space operations increasingly congested by commercial systems, and to control the growth of space debris in particular by avoidig anti-satellites tests. Military have also an overall interest in transparent communication as a way of preventing military incidents. U.S. military have been regularly seeking areas of cooperation with Russia and China that could play a role in helping assuring that the other party does not have ulterior motives when maneuvering in space. They have been even pondering the development of joint standards for station keeping so that one military is not alarmed by a sudden maneuver of the other’s satellite that was intended as station keeping, not as the beginning of an attack. The Stimson Center, a Washington-based think tank, published back in 2004 a “Model Code of Conduct for Outer Space”, which was periodically updated in consultation with experts from several countries, that code represented the key reference for International Code of Conduct for Outer Space Operations. There is another military concern in space that is highly controversial: deployment of weapon systems. Currently there are military systems in space but no weapons. Current military satellites cannot attack targets directly, they are “force enhancement”. They provide support to military operations by enhancing the ground/air/sea based capabilities for surveillance, targeting, reconnaissance, communications, navigation, etc. For three decades a debate has been raging between U.S. on one side and Russia and China on the other side on banning the deployment of space weapons. The initial concern was an altered nuclear balance of forces between the superpowers. The debate is better known as PAROS (Prevention of Arms Race in Outer Space), from the relevant draft treaty proposed jointly by Russia and China. The debate started following the US President R. Reagan decision to launch in 1985 the Missile Defense Program (a.k.a. Star Wars), which encountered major technological difficulties and was later restarted in a diminutive form (a.k.a. Son of Star Wars) by U.S. President G. W. Bush after September 11 2001. The ambition of the International Code of Conduct for Outer Space Operations proposed by the European Union is to mediate all security concerns and to establish a framework for cooperative exchange of operational data, but since the first round of statements by delegations at the UN meeting of last week in New York it seemed that the code, which has been in work for almost eight years, may be heading toward an unsuccessful end. First the issue was raised that although the meeting was held at UN Headquarters it was not to be considered a UN event because there was no UN mandate. As a consequence there was no legal ground for negotiating the text of the code in that seat. The negotiation was immediately dropped as objective of the meeting by the Chair and changed to consultation. Next were comments from various delegations that a possible UN General Assembly mandate could not be exclusive in the sense of preventing other countries to propose alternative texts for discussion. Besides procedural matters, although all delegations expressed their strong interest for cooperation in the peaceful exploration and use of space and for safeguarding the space environment, there was widespread disagreement on the code’s security scope. On one side there were countries essentially focused on international adoption of transparency and confidence building measures that were satisfied about the text. On the other side there were countries, which found the Code inadequate to prevent an arms race in space and fearing that the stated right to self-defense in the code may become a back door to legitimate space weapons. From the second day until the end of the week the meeting became essentially a reiteration of comments made at previous consultation meetings. “The code proposed by the EU aims to pursue a comprehensive approach to the challenges of safety, sustainability, and security of space activities. There has been during the past days and today a focus on security, some mention of space debris, very little or nothing about safety. Safety pertains to launch, reentry and on-orbit operations and involves risk for public on ground, traveling by air or at sea, human on board, and integrity of space assets. In particular all space bound and reentry operations cross the national and more often international airspace. As launch operations and air traffic increase the segregation will be no longer economically feasible and air and space traffic will need to be managed in an integrated fashion. Every space object in Low Earth Orbit (LEO) is coming back to Earth sooner or later. The fragments surviving reentry are a danger for the people on ground and a lethal threat for aviation because a fragment of 300 grams impacting an aircraft in flight is catastrophic. As of January 2015 there were 669 satellites operating in LEO, but there are recent applications filed with ITU (International Telecommunication Union) in Geneva for launching about 11,000 satellites (the so-called space-based internet ‘goldrush’) including mega constellations of 4,000 satellites each or more like those planned by SpaceX (USA) and STEAM-1 (Norway). Including the additional rocket upper stages that will be left in orbit after launching these satellites, atmospheric re-entries of space objects will become in future a multiple daily occurrence. There is then the risk of on-orbit collision that will be increasing exponentially if measure to coordinate space traffic on a daily basis are not taken. Space security is very important but it is not understandable why space traffic management and the preservation of the space environment should be addressed through a diplomatic initiative that is mainly aimed to put to rest a 30 years old debate on banning of space weapons. With reference to space debris, the code just reiterates each nation’s commitment to observe U.N. guidelines for the mitigation of space debris, which are already failing on their own because of limited enforcement: operators from 70 countries operate satellites but fewer than 10 of them have space agencies able to monitor their space activities. A vague commitment to international governance of space (by sharing of yet-to-be-determined operational data, through a yet-to-be-determined organizational setup) is all this code of conduct will provide to the commercial and civil space community — very little! Disclaimer: The author was member of the IAASS delegation invited to attend the meeting as Observer NGO. The account in this article represents the subjective point of view and interpretation of the author about some of the issues raised during the meeting, and on its overall outcome. Mr. Sgobba recently retired as Head of the Independent Flight Safety and Planetary Protection Office for the European Space Agency. In this role, he was responsible for flight safety of European Space Agency manned systems, for spacecraft reentry safety, and for space debris, use of nuclear power sources, and planetary protection. Mr. Sgobba joined the European Space Agency in 1989, after 13 years in the aeronautical industry. He supported the development of the Ariane 5 launcher, Earth observation and meteorological satellites, and the early Hermes spaceplane phase. Later, he became product assurance and safety manager for all European manned missions on Shuttle, MIR station, and for the European research facilities for the International Space Station. Mr. Sgobba holds an M.S. in Aeronautical Engineering from the Polytechnic of Turin (I), where he has been also professor of space system safety (1999-2001). Mr. Sgobba is co-editor of the first book on safety design of space systems, and Executive Director of the International Association for the Advancement of Space Safety (IAASS).